Two Russian Blackjack bombers were intercepted by fighter jets from four European countries as they flew from the direction of Norway to northern Spain and back, it has emerged. Norway, the UK, France and Spain all scrambled jets as the TU-160 planes skirted the airspace of each country. It comes at a time of heightened tension between the West and Russia. Correspondents say the frequency of Russian bombers being intercepted by Nato planes has increased markedly. Spanish media say it is the furthest south such an operation has had to take place. The incident happened on 22 September but the full extent only came to light recently in a statement by the French ministry of defence (in French). It referred to it as an Air Policing [Baltic support] mission by the four countries involved. It said Norway first detected the two Blackjack bombers to the north and scrambled two F-16 fighters to accompany them towards the north of Scotland. The British RAF then sent Typhoon aircraft from RAF Lossiemouth to intercept the planes as they flew to the west of Shetland. The RAF said at the time that at no point did the Russian jets enter UK air space. British Typhoons were also launched from RAF Coningsby in Lincolnshire as a precautionary measure, the RAF added, but did not intercept the bombers. The Russian planes then skirted the west of Ireland and were picked up by two French Rafale fighter planes 100km off the coast of Brittany, the French ministry of defence said. Two other Rafale jets later took over to shadow the bombers as they flew south. Finally, Spain sent two F-18 fighters to intercept the Russian planes north of Bilbao. The bombers then turned around and made a return journey. It is not believed that any further interceptions took place. 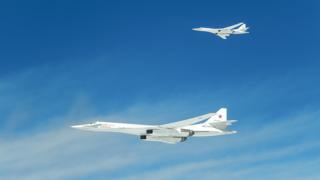 Iceland later complained to Russia that TU-160 Blackjack bombers had flown too close to civil airliners on the same day. The foreign ministry said the planes had flown between 6,000-9,000ft (1,800-2,700m) below a plane flying from Reykjavik to Stockholm. For the UK, it was the latest of several similar incidents involving Russian military aircraft. In November 2015, Typhoon fighter jets were scrambled from Lossiemouth to intercept two Blackjack bombers. RAF Typhoons from Lossiemouth were also scrambled in October 2015 to intercept two similar aircraft flying over the North Sea. Russia's relations with the West have declined since the annexation of Crimea from Ukraine in March 2014. They recently hit a new low when the US broke off military co-operation with Moscow over Syria.